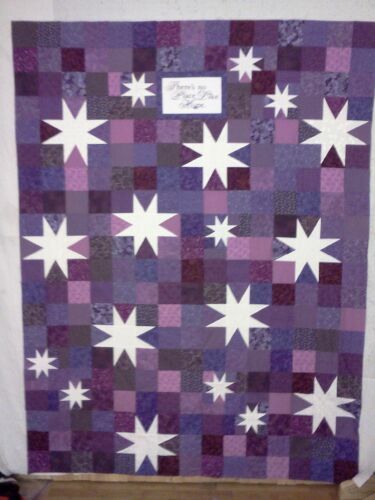 Marge, I made a quilt from your November Stars pattern that will be raffled off this weekend at the Fontana, Ca. Relay for Life. I took some creative license by renaming it Stars of Hope. I hope this is ok with you. Attached are pictures of the quilt top (I am just now putting the binding on it) and the label that will be attached to the back. I am utility quilting it on the diagonal. Like you I want my quilts to be used every day and worn out if possible. Thank you so much for your inspiration. I asked permission to share the photos and story and she replied..
Our team name is Jules Rules in honor of Julie Alvarez Fish. Julie was my daughter's sister-in-law. She was only 30 when we lost her to a rare form of intestinal cancer related to Celiac disease which she didn't know she had. She left 3 children (2 girls and a boy) and her devoted husband Danny who never left her side. She was not only a wonderful wife, mother and friend but also a beloved elementary school teacher. 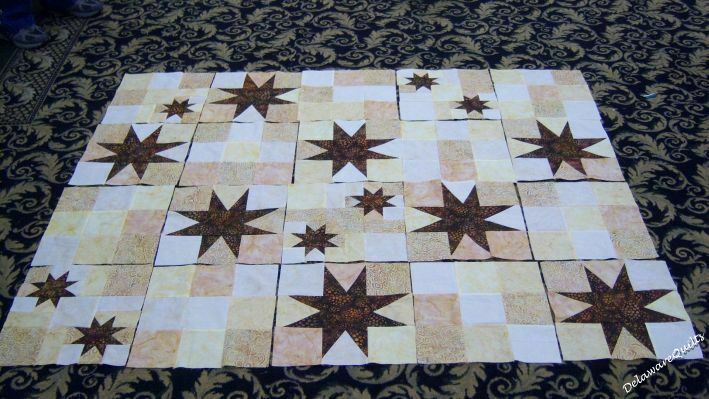 This was the November Quilters Retreat Mystery project for 2010. Here are a few WIPs made during the retreat.